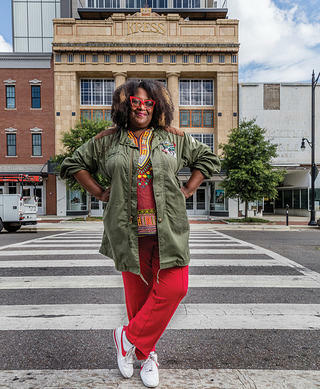 Michelle Browder never thought she’d run a tour company in Montgomery, Alabama. 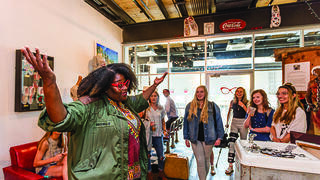 But as an outgrowth of her youth-based nonprofit, I Am More Than, she found herself constantly showing people the civil rights landmarks of her adopted city. In 2016 she started More Than Tours, which just moved into an office in the Kress on Dexter, a rehabbed 1929 building that opened in April. We spoke with Browder recently about her focus on historic places. What drew you to heritage tourism? I love history, I’m an artist, and I love children. I’m also the daughter of the first black prison chaplain in the state of Alabama, appointed by George Wallace. And my aunt was Aurelia Browder, the plaintiff in the 1956 U.S. District Court case Browder v. Gayle, in which bus segregation was ruled unconstitutional. What is your most popular tour? The Montgomery Mystery Tour. Everyone comes here for Dr. King, the march to Selma, and Rosa Parks. We cover those on our Civil Rights Tour, which is more of a basic tour. On the mystery tour, I take you to the hidden gems. You get the history of Alabama, the Native American narrative, the slave narrative. You get into where Montgomery is today. You get the civil rights narrative, and the Civil War too. What are some examples of those hidden gems? The tunnels in the city. At one point, Montgomery had around 164 slave traders. Those who wanted to be more discreet about their daily dealings would bring people through the tunnels and into the square. Also, the Kress, where our office is. The developers, Sarah Beatty Buller and Mark Buller of Montgomery Builds, saved the marble stones over the old water fountains that say “Colored” and “White.” It’s so important that they did that. It’s important that we don’t sanitize it. Michelle Browder in front of the Kress on Dexter. The stones are part of the tour. You have to see them in person to get that they were [still] there, 100 years after slavery ended. The response has been amazing. There’s not a dry eye when we get to that. We also have a Truth and Reconciliation Tour that takes people to the Equal Justice Initiative’s new Legacy Museum and National Memorial for Peace and Justice. Browder giving a tour inside the building. What is your favorite place to take visitors? One of my personal favorites is the center of town, where the actual slave market was. Every day, we retrace the steps of these enslaved people to that market [often without thinking about it]. We look at the buildings they built, the rail lines they put in place. Everything in Montgomery’s history [has] an African handprint. I think that’s something people don’t realize. Where are most of the tourists you meet coming from? We’ve had international visitors, and of course people from around the country. There’s a renaissance happening. I think people are looking for answers.